TS POLYCET HelpLine Centers List 2019 available. We have provided the TS CEEP Counselling Centers for the general and the reserved category candidates separately. So, the aspirants who have qualified in the Telangana Polytechnic Common Entrance Test can check the HelpLine Centers List given below. You can get more information regarding the tspolycet.nic.in CEEP HelpLine Centers on this page. State Board of Technical Education & Training will conduct the CEEP Exam every year. It is a State Level Entrance Exam. So, a large number of candidates all over the Telangana applied for the TS POLYCET 2019. Recently, SBTET Conducted the exam and announced the results. Now, the candidates are eagerly waiting for the Counselling Centers List. Applicants qualified for the exam are searching here and there to get the TS CEEP Counselling Centers List. So, the candidates need not waste your time anymore because we have provided the TS POLYCET HelpLine Centers List on this page. We suggest the candidates go to this page to get the complete details regarding the Polytechnic Entrance Exam HelpLine Centers List 2019. You all know very well that the first step in the Counselling process is certificate verification. You have to know the Counselling Centers List so that you can attend for that particular place during the Counselling time. Without having an idea about the TS POLYCET HelpLine Centers List, we do not know the location of certificate verification. So, the interested candidates must check the Counselling Centers List. You have to attend the Counselling at the place allotted. Based on the rank you scored in the TS POLYCET 2019 SBTET will provide the Counselling Centres. You can also get the TS CEEP 2019 Counselling process here. We have provided complete information about the TS CEEP Counselling Centers List 2019. So, the candidates who are willing to appear for the Telangana Polytechnic Entrance Exam can check the below details. You have to check these Counselling Centers List in advance, so you need not hurry during the Counselling time. We have provided the Rank and Category wise TS CEEP HelpLine Centers List on this page. The Counselling Centers for the PH/NCC/CAP People are different. Therefore, the interested aspirants can check these important details and appear for the Counselling Process. Government Polytechnic, Bellampally, Adilabad Dist. Govt.Inst.Of Printing Tech, East Maredpally, Sec-bad. PH (Physically Handicapped), CAP (Children of Armed Personnel), Anglo-Indian, Sports & Games, NCC (National Cadet Cops) should attend the Certificate Verification only at Sankethika Vidya Bhavan, Masab Tank, Hyderabad, as per the dates are given in the Schedule. The information provided above is only for the reference of the applicants. So, the candidates can check the official website. We have provided the direct link to the official site on this page. You can directly go to the official website by clicking on the link provided below. 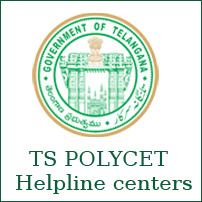 We will also update all other information regarding TS POLYCET Counselling Centers on our site. So, the candidates can visit our website regularly for the latest updates.